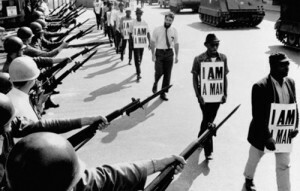 Listen in as I talk with Charles E. Cobb, Jr., about his book: This Nonviolent Stuff’ll Get You Killed: How Guns Made the Civil Rights Movement Possible. Cobb is a Visiting Professor of Africana Studies at Brown University. From 1962-1967 he served as a field secretary for the Student Nonviolent Coordinating Committee (SNCC) in Mississippi. This broadcast is an archive of the Marc Steiner Show. Cobb was on the book channel today (8/9) discussing the book- How guns made the civil rights movement possible in the title seems a bit opportunistic-and at one point he allows getting guns into the title might get some attention. Also seems a shame, to a degree, in our so gun crazed society of Zimmermans to b praising guns in any way- how does Cobb feel abt the NRA? Stand yr ground? How does he feel about the Heckler smart gun and gun control efforts? But he keeps the discussion focused on how such groups as the Deacons for Self Defense protected civil rts workers in the movement days, or retelling such glorious moments when the Mississippi farm woman orders the racist sheriff off her land- in her chair on the porch with her winchester at her side. It sounds empowering for Louisiana blacks to way- “We will shoot back”- and yet it could also invite a blood bath on both sides. I love the fact that the movement elevated the tactics of non-violence- so little valued in this culture and I don’;t like any one to tear it down- BUT- I can see Cobb’s point. Hopefully he gets into such shades of grey questions as- does he pack heat? Has violence worked in his life- how does he feel about it-? Do those who live by the sword always die by the sword- and yet he will probably say, I’m not a philosopher. Certainly he has paid his dues. At one point he enabled a redneck to go get his gun back by showing him the second amendment. The guy could’ve turned the gun on Cobb? I mean he rightly says the movement was about freedom- and I would add about struggle. update: Glad to hear the show with Charlie Cobb (Marc Steiner on 10/2/’14)- and thnks to him for his service- at one point he says.”There’s been no movement for non violence in and of itself”? ?That’s debatable…maybe Mark would have pointed out such groups as Jonah House, the Transform Now Plowshares- makes one wonder- did/does Cobb know about the peace movement? As usual- to little self criticism- and too little on the shades of gray. “Stand your ground”- but do we read abt blacks being exonerated as was Zimmerman- an article in the Post today (10/2) points out that civil rts charges may b dropped!! Gun control is plainly needed for such types as Cliven Bundy (in fact a racist) and the militia Tim McVeigh ilk. I realize Cobb is talking abt the 60’s and thereafter. What abt now? Should there b less gun control for leftists? I tried to call the program but the number didn’t work! 3 cheers for Brian Frosh and the rally yesterday in Columbia- for gun control in Md. !